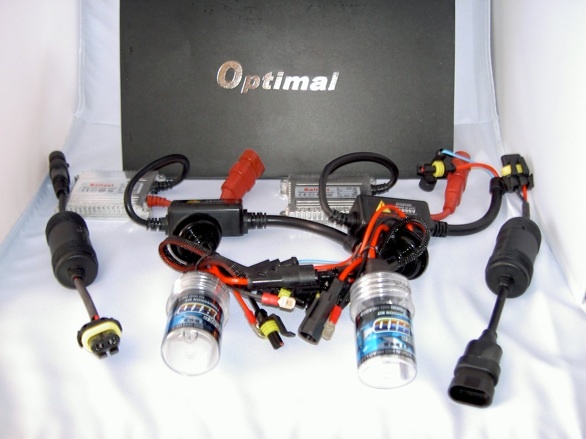 The technoLite HID is a complete conversion kit for your headlights. It will transform your yellow halogen lights into bright, white, modern Xenon lights, just like the factory litronics at a fraction of their cost. The OEM litronics are an $1,800 option. Our technoLite HID kit fits all 986, 987, 996, 997 and Caymans equipped with halogen headlights. You can clearly see the difference between the OEM halogen (left) and the technoLite HID (right). The light intensity is much brighter with the Xenon conversion. 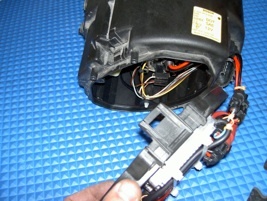 The 6000 °K color (right) is much whiter than the OEM supplied headlights (left). Another great advantage to the conversion kit is that the headlights’ operating temperature is much lower than with the OEM halogen lights. 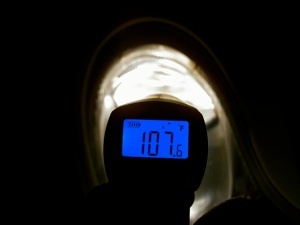 At right you can see a laser-temperature reading of 107.6 °F at exactly 15 minutes after turning on the Halogen. 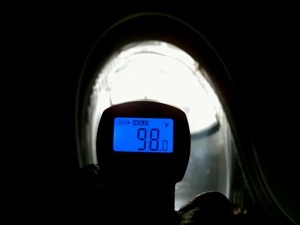 In contrast, you can see a temperature reading of only 98.0 °F at exactly 15 minutes after turning on the Xenon light. Even though the light is much brighter it is also much cooler which prevents the headlight lenses from turning yellow. 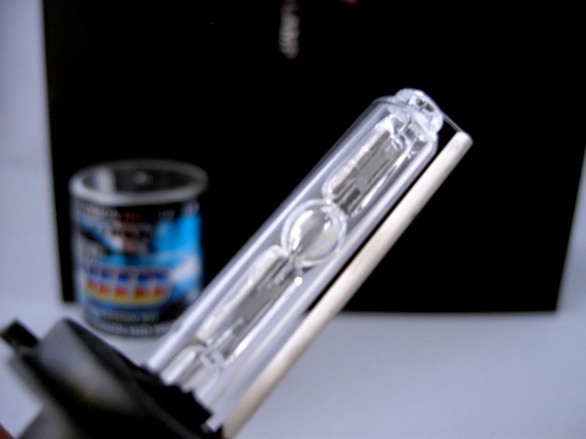 The secret is the high-quality, single beam, H7, 6000 °K Xenon bulbs supplied with the kit. 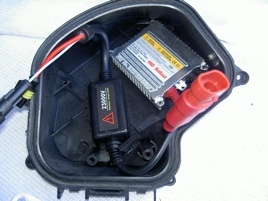 •Two CANBUS digital decoders for the newer (987) cars equipped with on-board-computers which otherwise would display a lighting error code. 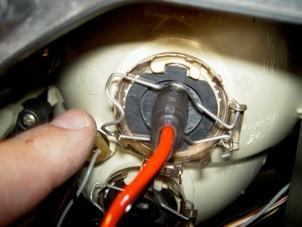 There are no wires to cut, splice or solder. You need to drill a 1” diameter hole on the headlight’s plastic case. All the electronics are plug-in and your headlights retain their easy pop-in, pop-out feature. 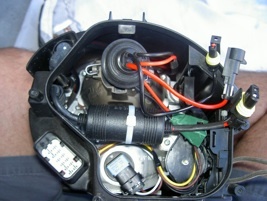 On the 986s (above), just as the OEM, the ballast and transformer, fit onto the back access panel of the headlights which remains easy to access for replacement of bulbs. If you have any questions or would like additional information, don’t hesitate to contact us. 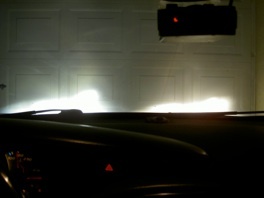 Here you can observe the much brighter and whiter light pattern from the HID (left) when compared with the Halogen OEM (right). We also offer a the technoLite LED DRL Kit which is a highly visible LED Daytime Running Lights. 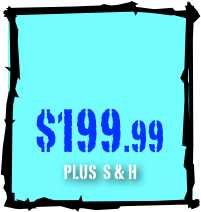 To see more information on the LED DRL click here. Installation can be done in under 60 minutes with simple tools. You will need a rotary tool (Dremel) or sharp X-Acto type knife . With this kit only the low beams are replaced with Xenons, as is generally the case from the factory. 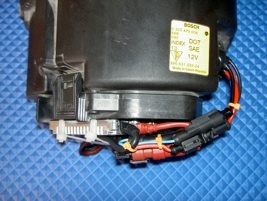 The high beams as well as the front fog lights remain H7 halogens.